https://mysonginthenight.com/songwriting/ I bet you have all heard some sort of horror story about spiders and their “interesting” family habits. Orbweaver females tend to consume their mates, yum. Spiderlings sometimes eat their mothers (not only the nerves, but the flesh and all). And sometimes mothers eat their offspring, gulp! We humans tend to remember these gruesome tales, but let’s talk about the admirable wolf spider mother for a moment. visit website Spiders from the Lycosidae (wolf spider family) exhibit unique traits with their offspring, even before they are born. A wolf spider will lay eggs and wrap them in an egg sac. Nothing unusual here, most spiders do this. But most spiders leave their egg sac somewhere and continue about their daily lives. The wolf spider mother, however, will carry the egg sac in her spinnerets, the organ that shoots out silk from the abdomen toward the rear of the body. Her motherly instinct doesn’t stop there: when spiderlings hatch, she will give them a piggyback ride for about a week before the “kids” disperse. 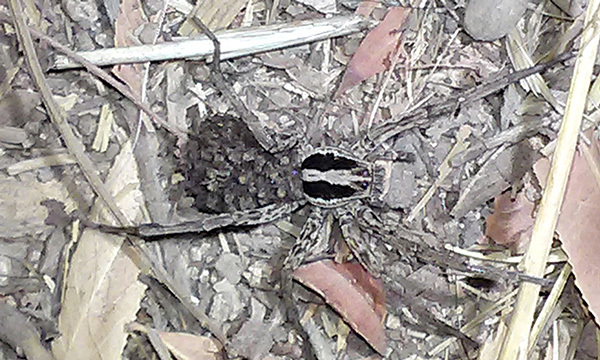 https://mediaspectrum.net/healthcare/ order now Like most spiders, “wolves” are creatures of the night, so it is quite rare to come across a mother carrying her offspring, but klyle161 had that privilege and shared it by posting an observation on iNaturalist: bit.ly/2RyzQHG. The wolf spider observation is just one of many posted by klyle161. She is one of the top observers in the Mission Trails Regional Park (MTRP) biodiversity project on iNaturalist with over 500 observations. Clearly, MTRP is one of her favorite exploration grounds. Congratulations to her and a big thank you for her contributions. Get your cameras out and try to catch up!